1.1.2 What Can You Do With HDFC Bank ONchat? HDFC Bank Onchat – Hey Coolzdeals Readers, We Hope all are enjoying Free Recharge Tricks and take benefit of PayTM Free Recharge. As always we post amazon quiz first on the net with all correct answers. HDFC is Giving you a Chance to Get up to Rs.600 for Free. You can get Rs.50 Per Refer. You can Earn Up to Rs.600. That Means, Refer 12 Friends and Do a Recharge of Rs.600 For GFree. This Offer is live until 31st March 2019. 1. First of Download Fb messenger if You Don’t Have. 2. It will redirect to onchat messager. Click on Get Started. 3. They will ask You for Mobile Number. Type Number and Verify It with OTP. You have to Write Otp in Chat. 4. After that type “refer and earn”. 5. You will get Refer link to your mobile number. 6. Now, refer at least 1 Friends to get Rs.50 Free in your Account. 7. Type “My Onchat Points” to show youronchat points. Get Flat Rs.25 cashback on each successful Referral Signup of your friend. Flat Rs. 25 Cashback on each successful Referral Signup of your friend. 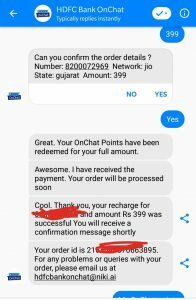 What Can You Do With HDFC Bank ONchat? What Can You do other than referring and earn? See below All Stuff. And Soon they are Launching Hotel Booking, Flight Tickets Also. I tried this offer and have earned the referral points on my “hdfc bankOnchat” account. It actually pays you 50 bucks for each referral signed up for this service. Great isn’t it.